(Darkhold: Pages from the Book of Sins#8) - Samantha was angry at her parents because they had spent her fortune to investigate the occult. When she saw a letter addressed to her falling from the sky into the lake in Boston's Public Gardens she picked it up. She thought she had only imagined the Dwarf's face underwater.....but she didn't actually. (Nightstalkers#8 (fb) - BTS) - Samantha told Richard about the letter she had received and how its content, a page from the Darkhold, could supposedly wipe out all the occult. 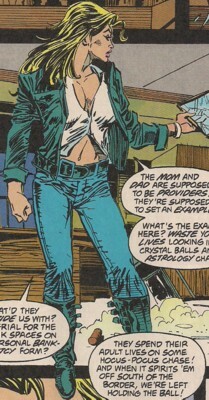 (Nightstalkers#8) - Samantha met with her brother at the Regent Residence and told him that she considered using the page to get everything back because their parents had wasted much of their money on "crystal balls and astrology charts". 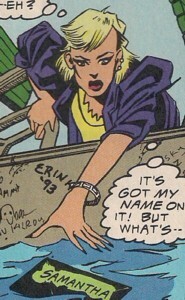 (Nightstalkers#9) - Still mulling over whether or not she should use the Demogorge page, Samantha Regent went out to a nightclub. She attracted the attention of a man called Maxxy. After Sam left the club Maxxy followed and attacked her, leading to Sam being hit by a car. Maxxy took the envelope. (Nightstalkers#10) - Blade found Samantha Regent recovering from her wounds at Massachusetts General hospital. Reluctantly she cooperated, telling him about Maxxy having taken the envelope. Blade retrieved the letter and escaped Frank Drake, Hannibal King and John Blaze, who had learned of his plan. Blade summoned the Other, was transformed into the Demogorge, and adopted the name Switchblade. Comments: Created by Chris Cooper (writer), Rurik Tyler (pencils) & Bud LaRosa (inks). (Nightstalkers#9) - Maxxy met Samantha at the Pandemonium club in Boston. He hit on her and didn't like it too much when she rejected him. He followed her to the street and stole her purse, which had the Darkhold page stashed inside, from her before she was run over by a taxi. (Nightstalkers#10 (fb) - BTS) - Maxxy used Samantha's credit card to buy a VCR. (Nightstalkers#10) - While in hospital Samantha was interrogated by Blade about the Darkhold page's whereabouts. She told Blade about Maxxy, whom he tracked down at an abandoned building. Maxxy ran away from Blade, who caught up with him, and demanded the black letter from the purse. Maxxy didn't even know what Blade was talking about, but Blade took the Darkhold page from the purse nonetheless. (Nightstalkers#8 (fb) - BTS) - Samantha told Richard about a letter. (Nightstalkers#8) - Richard met with Samantha at their parents' house. She was upset about all the money their parents wasted on the supernatural and told Richard that there was a way to get everything back. He knew she was talking about the letter she had found at the Public Gardens. Concerned, Rich called Borderline Investigations and the message was heard by Blade. (Nightstalkers#9) - Blade met with Richard at a bar and took the case. Richard told Blade that Samantha had gone missing, but wasn't so sure anymore if hiring Blade was the right idea. Blade promised to find Samantha because he wasn't going to stop now. (Nightstalkers#10) - Blade called Richard to tell him his sister was at Massachusetts General hospital. King and Drake broke into his apartment while Richard was still on the phone with Blade. King told Blade to come back to his senses. Richard told King and Drake about his sister and how worried he was about her.